For the longest time now my heart has been longing to grow the Fruit of the Spirit. 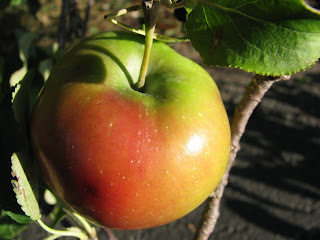 I remember walking around our yard in the spring to the 5 apple trees on our property and pruning the branches that were dead, and again this fall taking off an apple if two were growing on the same bunch. I had John 15:4-5 (or of what I could remember of it) playing in my head over and over picturing God walking around me and pruning off the things in my life that are dead and not letting me thrive, and making room for the fruit he wants me to have in my life. Now I started thinking about this in the spring, and am sad to say I really haven’t dedicated time to really devote myself to letting God develop fruit in my life. I feel like I have been in a stalemate and not really meaning to, but I know that if I really really wanted it, I’d be able to tell. Right? I got out my devotional about the Fruit of the Spirit and have started reading it. Already I have felt a sense of peace that God is happy with me noticing a dryness and now being thirsty to go all out wanting to get deep with him. I am really excited to see what God has in plan for me, and watch him prune me like I did with the apple trees in mine and Tim’s yard.